These Variegated Lady Palm are extremely rare and truly amazing plants. They are really unique and highly sought after by breeder and enthusiasts alike. Even the home gardeners desire a share of these mesmerizing variegated palms. Botanical Name: Rhapis excelsa cv. Variegata. 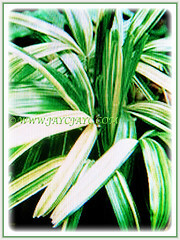 Common Names: Variegated Lady Palm, Variegated Bamboo Palm, Variegated Broadleaf Lady Palm. Origin: Native to southern China, Taiwan and southeastern Asia from Japan, Thailand and to Sumatra. It is popularly cultivated worldwide too. 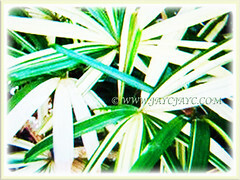 Plant type: An ornamental and rhizomatous palm tree with variegated foliage. 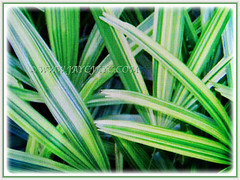 Features: Rhapis excelsa cv. 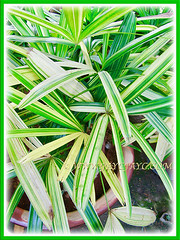 Variegata is from the genus, Rhapis that consists of 10 species of small palms. A favourite with horticulturists who have come up with hundreds of different cultivars or varieties, especially in Japan where there are over 100 named cultivars. 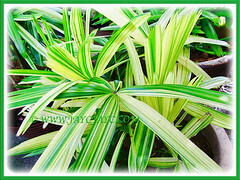 These somewhat dwarfish palms have varying variegation on the leaflets, namely with assorted hues of light to dark green adjacent to cream, yellow or white stripes. The variegation runs longitudinally along the leaflet axis. This variegated palm is extremely slow growing, reaching to a height of about 1 m.
It self-propagate via underground rhizome, forming multi-stemmed clumps. Each slender and upright stem is covered with a coarse matted brownish fibrous material at the outer base of the leaf sheaths. When these sheaths eventually fall, leaf scar patterns are revealed, resembling bamboo canes, giving one of its common name, Bamboo Palm. Variegated leaves are borne along the stems, with new frond emerging from the top center of stem. They are held on slender petioles, 22-30 cm long. The palmate leaf is divided into broad strap-like, ribbed segments, ranging from 5-13 segments and fanned out in a semicircle. Culture (Care): Rhapis excelsa cv. 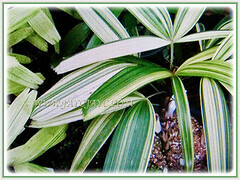 Variegata can be easily grown with minimum maintenance. Light: Full sun to semi-shade. Does best in dappled light with some morning sun for best leaf colour and optimum growth. Moisture: Medium water needs. Water moderately and regularly, especially during hot weather. These palms should be watered thoroughly to drench the entire root system. Also, drought-tolerant once established. Soil: Humus-enriched, sandy, loamy and well-drained soils. Others: Use serrated scissors to prune off unattractive leaflets at their ends to improve the plant’s appearance. Remove spent leaves at their base as they form. Cut away dried or discoloured leaves to keep it tidy and improve ventilation. To keep the plants healthy, shower them with a water hose occasionally to remove dust and dirt. It prefers to be slightly root-bound. Feed once monthly with a liquid foliage fertilizer at half-strength as Rhapis excelsa are susceptible to fertiliser burn. Generally free from serious pests and diseases. However, do watch out for scale and spidermites on the palms and treat them soonest. For subtropical and temperate regions: Hardiness: USDA Zone 9 – 11. Rhapis excelsa cv. 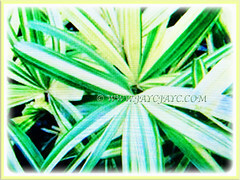 Variegata is a hardy palm that tolerates temperature as low as -5° C. Lower temperatures will kill stems but plant may recover. It can be grown outdoors in subtropical or warm temperate climes. For non-hardy regions, grow it as a potted plant and bring it to overwinter indoors. Ideal to be grown as a houseplant in a greenhouse with sufficient light. Propagation: By division of clumps (canes) that readily produce offshoots from underground rhizome. Usage: Rhapis excelsa cv. 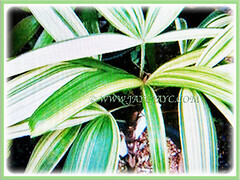 Variegata or Variegated Lady Palm is an extremely versatile palm that will look great with its variegated foliage. Ideal for container planting or above ground planters outdoors and indoors. 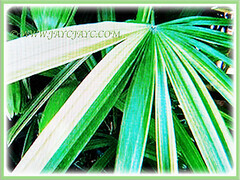 Use it as a landscape or specimen palm in your garden. Suitable for informal screen with its dense foliage. 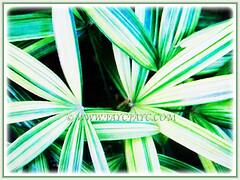 These captivating variegated palms are popularly used as decor plants in homes, offices and hotel lobbies. Great too as an accent at courtyard, porch and patio.